As discussed, Black Flag’s Greg Ginn is being accused of child abuse by his ex-wife Marina, who filed an affidavit in October which expressed that their 7 and 10 year old daughters don’t feel safe around their father. It accused Greg of abusing alcohol and drugs in front of them, engaging in physical violence with others in front of them, telling his daughters “you’re hot” and whistling at them, telling them that they are fat and denying them food, and other abusive behaviors. Now it has come to our attention, via an associate of Marina, that Greg’s former Black Flag bandmate Ron Reyes appeared in court the other day to detail what he experienced regarding Ginn’s children, their home life and what he saw at Black Flag rehearsals. We were sent Ron’s statement as a notarized affidavit which you can read in full as a PDF HERE. It is also excerpted below. When you hear things that trouble your heart, especially the heart of a parent… well lets just say that it is hard to stay silent and wash your hands and somehow walk away hoping to remain safe and unaffected. I am very troubled by what I have heard over the last couple months. And all I can hope for is that somehow things will work out in favour of two very precious children so they can live a life that is safe and full of love, support and guidance they deserve. Whenever a woman speaks out about abuse people want to second guess her and cast shame and doubt over her claims. This infuriates me to no end as I have two daughters and a wife of 27 years that I love to death. It is just not right to immediately doubt and somehow pour shame onto a woman for speaking out based on gender. I have no love of lawyers and do not look forward to the backlash I will receive for lending a voice of support to those who have reached out to me. But called i have been and I just can’t ignore that. People please consider the source of all accusations carefully and pray for an outcome of peace and love and safety for children who cannot speak for themselves in court. The upstairs area was generally filthy. There were almost always dirty pots, pans and dishes in the sink and food and food containers left out on the counters. The bathroom was filthy as well, like it had not been cleaned in a very long time. The bathtub was grimy, and there were dirty towels all over the floor that had been there some time. People still used it to shower, and since [Black Flag sound engineer] Mike [Shear] lived there it was his only bathroom. I also used it while I was there. I could see there were kids bath toys and shampoo next to the tub, so it was seemed that the children used it too. Once Greg got to the studio he would start smoking marijuana out of vaporizer he kept in the rehearsal space, usually up on the stage area. He would smoke constantly throughout the day, usually using the vaporizer every half hour or so. He would also drink wine, usually consuming a bottle or two each day. We would practice or record usually until 2-3 a.m., and he would almost always be smoking marijuana and drinking the entire time. He had a friend (that I presumed was his dealer) that would visit the studio while I was visiting and re-supply him. Greg would not allow the kids in the studio. They also weren’t allowed in the office or the warehouse as far as I could tell. They were just left in the hallway outside of the recording studio all day when I was there. The hallway has a concrete floor, but no chairs or anything to sit on, so the kids would just sit on the concrete and wait for Greg. …A few times a day they would knock on the door or open the door and try to tell Greg they were hungry. He would quickly go over and usher them away from the door and close it, but usually he would make them wait, hours usually, before he would break for food and, I assume, feed them. …The only time there was adult supervision in their lives was when people were hired by Greg to look after his kids. The environment seemed totally inappropriate to me, and the way he completely neglected his daughters was very disturbing. 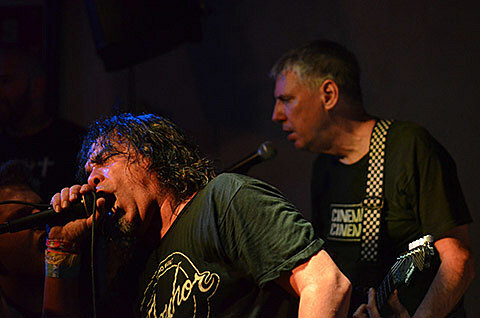 I spent a lot of time in close proximity to Greg Ginn in the time I spent at his property in Taylor. From what I witness, I firmly believe from what I witnessed that Greg is not capable of caring for children. His drug problem is too severe, and appears to have taken a toll on his mental health. His children deserve far better parenting, care and guidance than he is able to provide them. Read Ron Reyes’ full affidavit here. Ron left Black Flag in 2013 after Greg allegedly threatened him and his family. Ron now plays in the band Piggy.